On Wall Street on Monday, the Dow Jones Industrial Average and the S&P 500 marked modest gains, though the Nasdaq Composite edged down slightly. You can download JioCloud app from Google Playstore or Appstore. Tokyo: Asian shares edged higher on Tuesday, taking solace from modest gains on Wall Street even as investors remained wary ahead of the annual central banking conference in Jackson Hole later this week. MSCI's broadest index of Asia-Pacific shares outside Japan edged up 0.1 percent. South Korean shares added 0.5 percent, despite lingering worries about tensions on the Korean peninsula. The country's forces began computer-simulated military exercises with the United States on Monday, which Pyongyang has denounced as a "reckless" step towards a nuclear war. 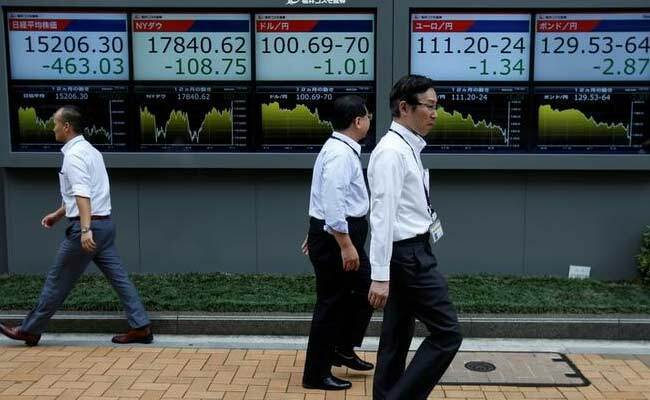 Japan's Nikkei stock index dipped 0.1 percent, while Australian shares added 0.2 percent. The dollar index, which tracks the greenback against a basket of six major rivals, was steady on the day at 93.108. The euro was flat at $1.1815, while the dollar steadied against its Japanese counterpart after slumping overnight, up 0.1 percent at 119.11. The dollar has recently faced selling pressure from cool U.S. inflation data as well as concerns that ongoing political turmoil will prevent President Donald Trump from implementing much of his aggressive stimulus and tax reform measures, which in turn could lead the U.S. Federal Reserve from pursuing further policy tightening. "Fed fund futures are showing well below even odds at this point for a move between now and the year-end," he said, adding that while he still expects one more interest rate hike this year, many investors do not. Expectations of what might emerge from the Fed's annual conference in Jackson Hole, Wyoming are also "relatively tempered," he added. Crude oil prices inched higher, lifted by indications that supply is gradually tightening, especially in the United States. Brent crude futures added 14 cents to $51.80 per barrel, while U.S. crude rose 15 cents to $47.52.